Cool (and hilarious!) PWYW pdf that codifies loot boxes as Deck of Many Things-ish items! This humble pdf clocks in at 12 pages, 1 page front cover, 1 page editorial, 1 page SRD, leaving us with 9 pages of content, so let’s take a look! This pdf was created for the Roll for Combat podcast, and this review was moved up in my queue, to be undertaken at my earliest convenience. It should be noted that the majority of the pdf is laid out in a one-column standard, while the introductions and basic guidelines provided are laid out in a two-column standard. Now, the main meat of this pdf would be taken up by the two tables that let you randomly determine contents of loot boxes. The lesser loot box’s table comes with 20 entries, three of which are multiple rerolls or rolling on the greater table. And yes, the “Premium Currency” is noted before? Well, the civilization that once held it dear is long gone, so it’s just as worthless as all the real-life in-game currencies that companies scammed out of their customers. And yes, I’m still sour on having a couple of “XYZ points” left from purchasing DLCs and the like. ;P Anyhow, the lesser loot box of wonder takes a cue from the time-honored tradition of chaotic items like, obviously, the rod of wonder. The effects are genuinely FUNNY. There is a nasty debuff called “Hard Mode”; the chance to be affected by poison gas, that you lose a serum, that you get a town portal, but there also are some really potent ones – like gaining one of a variety of crit effects for ALL attacks made! And no, this has no duration noted, which may be an oversight, considering that the other beneficial properties only last for 24 hours. The greater loot box of wonder has 15 entries that include more Premium Currency, being temporarily banned from the space-time continuum (lol), an attack by spacegoblins trapped inside, an upgrade of an item, a new voice…or what about having all armors take on a premium skin? One of the most potent effects lets you roll a d% when you spend Resolve, and on a 91-100, the Resolve is not spent. Gaining a resistance-based premium aura or golden skin – there are many of the vanities we associated with online games, represented with proper rules, though e.g. the golden skin’s bonus type is not codified – I assume, though, that this is intentional. Editing and formatting re very good on a formal and rules-language level. Layout adheres to both a two-column full-color standard for the set-up, and a one-column table for the tables. The pdf sports quite a lot of great, original full-color artwork, which is damn cool. The pdf has no bookmarks, but doesn’t require any at this length. Thurston Hillman, with Stephen Glicker as developer, provides a genuinely funny, cool little pdf with great production values here. This really gets loot boxes and pokes fun at them in a smart and intriguing manner; and this extends to one aspect of the pdf I adore – it’s PWYW. This humble little pdf is definitely worth checking out and leaving a tip for. While not 100% perfect, it is a genuinely funny supplement, and as such, my final verdict will be 4.5 stars, rounded up for the purpose of this platform. And yes, this gets my seal of approval. You can get this pdf for PWYW here on OBS! 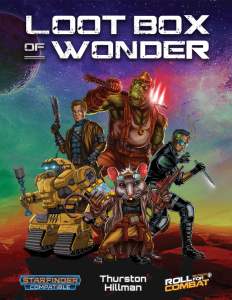 You can check out the Starfinder actual play podcast Roll for Combat here!